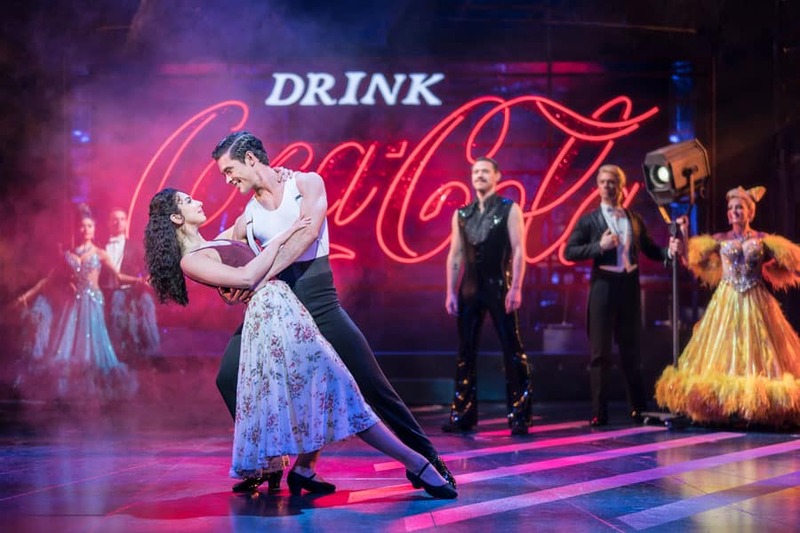 Douglas Mayo reviews Strictly Ballroom the musical based on Baz Luhrmann’s film which is now playing at London’s Piccadilly Theatre. Strictly Ballroom started life as a play script workshopped by Baz Luhrmann based on his early life experiences as a competitive ballroom dancer in Australia. It’s a world where the the theatricality of the performances, the larger than life participants and the egos of the organisers lent themselves perfectly to Luhrmann’s heartfelt, comic tale. The show had its UK premiere at the West Yorkshire Playhouse in December 2016, in a production directed and choreographed by Drew McOnie. Someone though made a decision to make some substantial alterations to that show and what is now being presented at the Piccadilly Theatre whilst retaining some of the shows core is a very different beast indeed. 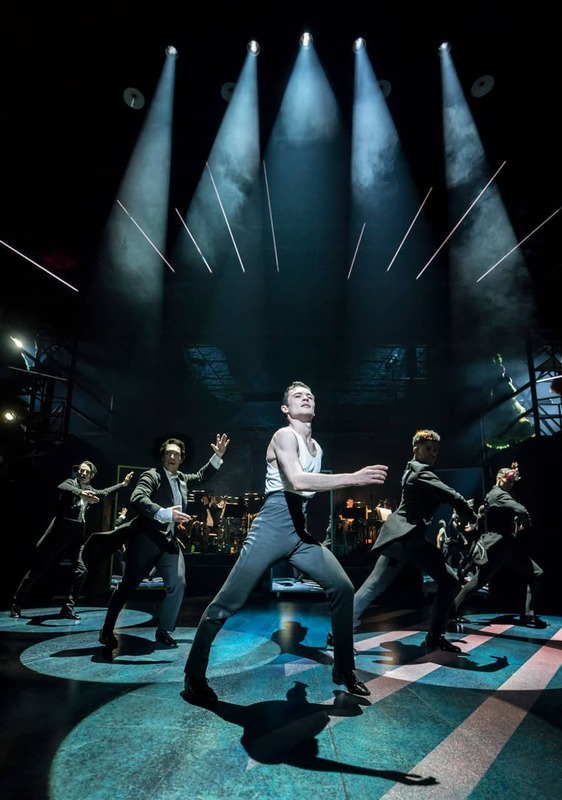 Whilst the production in Leeds was very much a musical, what we now have is something that isn’t quite a musical, has the structure and musical soundtrack underscoring of a film and as a result just feels a bit offwhack, and that’s really the only word I can find to describe it. Will Young plays the newly created role of Wally Strand. 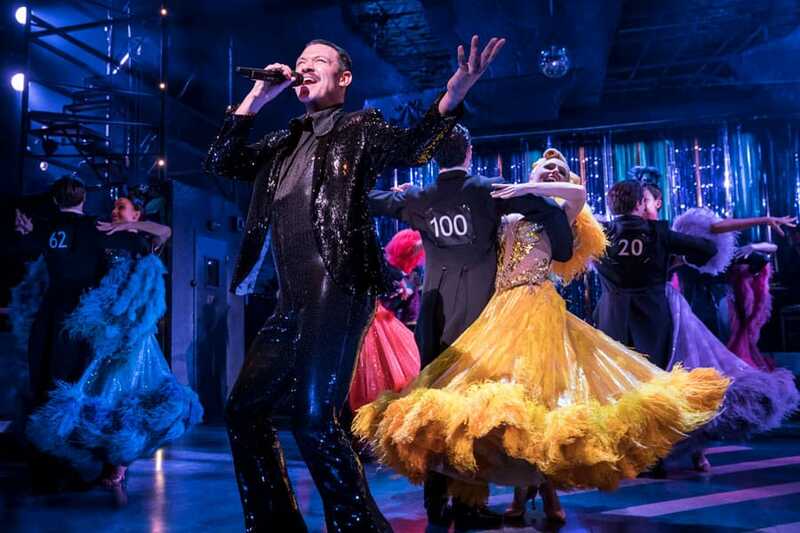 Acting as a comedic narrator and singer of the show’s pop derived score, Strictly Ballroom now seems to be the jukebox musical that isn’t a jukebox musical. Will commands the stage and the there’s plenty of warmth from the audience, you just have to wonder what prompted the change? Was it the need for a bankable star? Jonny Labey stars as rebel dancer Scott Hastings, whilst Zizi Strallen plays Fran (Just Fran), nerdy beginner and catalyst for many of Scott’s actions that drive conflict in this plot. There’s real chemistry in this combination. It’s wonderful to watch the dance and Strallen’s ugly duckling transformation as the show progresses. Anna Francolini (Shirley Hastings), Richard Grieve (Les), Gerard Horan (Barry) and Stephen Matthews (Doug) provide the establishment quotient of this tale as parents, family and Dancing Association President. Over the top and played to a large degree as grotesques, they contrast beautifully with the young leads. Stephen Matthews particularly had my attention with his beautifully underplayed Doug Hastings, the subtlety in this performance, the development of the character, the unabashed joyousness of the flashback sequence, and the characters reclamation of the balance of power at the shows conclusion is beautifully observed and performed. Of course, Ballroom isn’t Ballroom without the exotic, bizarre, flamboyance of the dancers themselves, and like the plethora of sequins in their garish costumes (courtesy of the brilliant Catherine Martin), they are nothing hort of dazzling. Michele Bishop, Gabriela Garcia, Charlotte Goch, Liam Marcellino,Lauren Stroud, Gary Railings, Chrissy Shunt, Dale White, Jacon Maynard, Selina Hamilton, Freya Rowley, Luke Jackson, Tinovimbanashe Sibanda, and Justin-Lee Jones work it for all they are worth. Frenetic and mesmeric there’s skilled assurity and loads of entertainment to be had watching this talented group of dancers. Magic! Fernando Mira (Rico) commands the stage for the Paso Doble (Habenera) Act One closer. Testosterone overload with incredible timing and intricate presentation combine to make Mira’s performance one of the highlights of the show. Eve Polycarpou’s Abuela is played with comic honesty and has so much heart. Soutra Gimour’s set has lost some of the simplistic rustic rundown look of its original incarnation which so perfectly matched the colours of the rural Aussie landscape. Replacing it are a plethora of moveable set pieces which at times gave the stage the look of a major expressway where a traffic jam from a major car pileup could hapen anytime. I found it all just a bit busy and it detracted from the simplicity of the story and the performances. Ben Atkinson’s terrific onstage band played Simon Hale’s dynamic orchestrations to perfection. When the brass section let rip it’s realy something. Make a point of hanging around for a few moments at the end of the show to hear the playout. Wow! 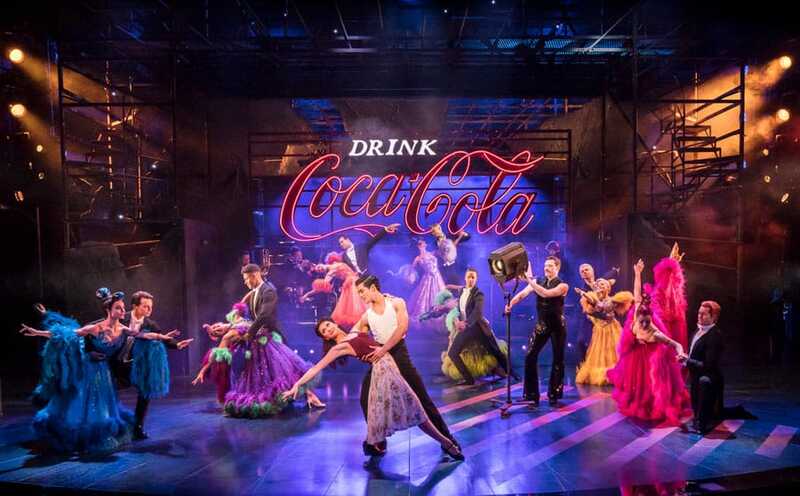 Strictly Ballroom could be a great show, and the fault, in my opinion is not with the hard-working cast who are giving it 110% but with the show’s writers Baz Luhrmann and Craig Pearce who have ceated a hybrid film/ musical/ concert that really doesn’t know what it is anymore. Finally, I have to take my hat off to director and choreographer Drew McOnie. Another job well done and now off to bring King Kong to Broadway. It’s great to see the next generation of creative talent in this country is here and looking like being as iconic as any of the musical theatre greats be they from Broadway or London who have come before. Strictly Ballroom is a fun night out. It’s just a shame that it lost that special something that made it special somewhere on the road to the West End.